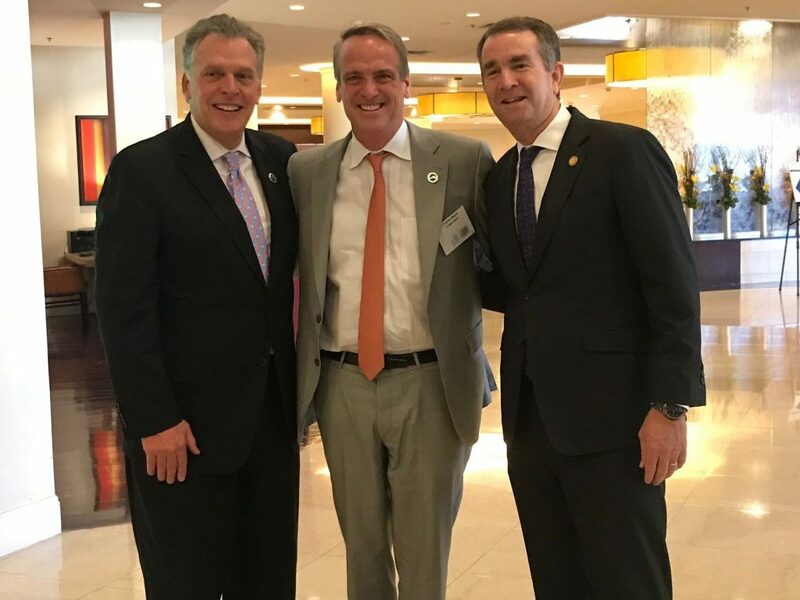 Chair Elect, Charlie Meyer of the Virginia Chamber of Commerce, met with former Governors Terry McAuliffe, Bob McDonnell, and George Allen (not shown) as well as current Governor Ralph Northam for the Chamber’s annual 2018 Virginia Conference on World Trade. The conference brought together hundreds of Virginia and international business leaders looking to take advantage of Virginia’s business friendly climate by relocating to the Commonwealth and expanding trade opportunities. With over $36 billion in trade responsible for hundreds of thousands of new jobs and businesses in the Commonwealth, Virginia has transformed its economy from being the greatest exporter of cigarettes in the country to the greatest exporter of nano-technology, bio-tech, and manufacturing products in its history. As former Governor McAuliffe was quick to remind everyone, “Virginia is for lovers- and also for business!”.